Moving away from the traditional Peanut Brittle, this recipe adds a little spice where there wasn’t any before. This spiced peanut brittle is to die for, and don’t forget to change up the nuts and spices to create all kinds of flavors. Makes a great gift too! It’s Monday, and it’s time for This Week’s Cravings again and what a fun week! Our theme this week is Christmas Baking: Sweets, Treats, Candy & Gift Ideas. I’m proud to be co-hosting This Week’s Cravings along with Tina over at MOMS CRAZY COOKING, Kristen from From My Tiny Kitchen, Angie from Big Bear’s Wife & Kristi from Veggie Converter. So have you made any delicious Christmas Baking recipes like Sweets, Treats, Candy or Gift Ideas? Want to link up? Yes, you – if you have a recipe that follows that theme, link up down there at the bottom in the linky. It will be awesome. (make sure you read the simple rules first). And make sure it’s for Christmas Baking: Sweets, Treats, Candy & Gift Ideas. I spend a great deal of time in the kitchen at Christmas. Not only do I enjoy cooking more in the cold winter months, than the hot, sticky summer months, but baking is by far a favorite. We make loads of cookies and brownies to give away at holiday time. 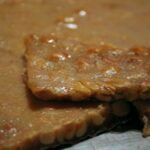 A couple of years ago, we had this delicious Spiced Peanut Brittle at a Christmas party, my daughter loved it and begged the hostess for the recipe. Alright, first a few tips to make this go smoother, because trust me, we’ve had our good batches and our bad batches. – Make sure you measure everything very carefully – you might not think it matters, but it does. I’m a little of this and a little of that baker and THIS is not one of those recipes. Follow the measurements. – You may lightly spray your pan with cooking spray, in fact the original recipe calls for it – but I’m going to tell you that the only thing I have found that has actually worked and made it easier to remove the brittle is (and I don’t normally plug a product, but I guess I have to say I swear by it) Reynolds Wrap Heavy Duty Non-Stick. No, generic brands won’t work and neither will any other Reynolds Wrap product. (Except they now have the Non-Stick Pan Lining Paper, and I have not tried it yet – but I will this year). – Refrain from using cooking spray if at all possible, it keeps your brittle from getting greasy. – Use cooking spray on your spatulas, measuring cups, etc. if you need to to avoid the sticky situation that results in using corn syrup. If you don’t use the cooking spray, just submerge them in a sink full of hot, soapy water and then clean them within a few minutes. You’re making this in the microwave. Your bowl needs to be small enough to fit into the microwave, but large enough to allow the rising of the ingredients from bubbling over. I use glass everything, one because it’s microwave safe and two because its easier to clean the sticky mess off of. In your large glass bowl stir together light corn syrup, sugar, peanuts and 5 spice powder until mixed together. Yes, it’s hard, keep going until its really well blended. Trust me on this. By the way, the 5 spice smells heavenly – and even more heavenly when you pop it into the microwave. Once you have it well blended, put the bowl in the microwave and heat on high for 6 minutes. Remove from microwave – careful – it’s super hot and will burn you and it sticks to everything. Stir in your butter and then pop back into the microwave 30 seconds more. Carefully remove from microwave and place on sturdy surface. Stir in baking soda until the mixture is light and foamy. Remember to stir carefully, and a little quickly. As quickly as you can, using a spatula (that I strongly urge you to have sprayed with some cooking spray), scrape the mixture out of the bowl and onto your foil covered baking pan. Using the spatula, smooth it out into a thin layer and allow it to cool for a couple of hours. The original recipe said 1 hour, but we’ve found the longer you allow it to sit, the easier it is to break into pieces. Once it is completely cool, break the spiced peanut brittle into pieces and enjoy. Store the spiced peanut brittle in a well-sealed container. Notes: If you are wanting to make the spiced peanut brittle a little more festive, try different nuts, mix up different types and use different spices instead of the 5 spice. We’ve done all of that, and have come up with some awesome peanut brittle. Enjoy!! This is a BLOG Party hosted by MOMS CRAZY COOKING and co-hosted by the blogs listed in the top paragraph. If you are a regular link-up we’re excited to see what you made this week. If you are new please read and follow the simple rules, so that everyone can enjoy the linky party! If you forget to follow the theme, your post will be deleted. Please don’t feel hurt, just come back and link up a recipe that follows the theme. Thanks a million, we look forward to blogging with you! The LINKY PARTY is opened ALL Week! PLEASE do not link more then 3 recipes per week. This week’s theme is: Christmas Baking: Sweets, Treats, Candy & Gift Ideas. Moving away from the traditional Peanut Brittle, this recipe adds a little spice where there wasn't any before. This spiced peanut brittle is to die for, and don't forget to change up the nuts and spices to create all kinds of flavors. Make sure you measure everything very carefully – you might not think it matters, but it does. I’m a little of this and a little of that baker and THIS is not one of those recipes. Follow the measurements. You may lightly spray your pan with cooking spray, in fact the original recipe calls for it – but I’m going to tell you that the only thing I have found that has actually worked and made it easier to remove the brittle is (and I don’t normally plug a product, but I guess I have to say I swear by it) Reynolds Wrap Heavy Duty Non-Stick. No, generic brands won’t work and neither will any other Reynolds Wrap product. (Except they now have the Non-Stick Pan Lining Paper, and I have not tried it yet – but I will this year). Refrain from using cooking spray if at all possible, it keeps your brittle from getting greasy. Use cooking spray on your spatulas, measuring cups, etc. if you need to to avoid the sticky situation that results in using corn syrup. If you don’t use the cooking spray, just submerge them in a sink full of hot, soapy water and then clean them within a few minutes. Once it is completely cool, break the brittle into pieces and enjoy. Store the brittle in a well-sealed container. This week’s theme is: Christmas Baking: Sweets, Treats, Candy & Gift Ideas. Please only link recipes with our theme! Definitely wasn’t too complicated and the flavor was really good. Thanks!